The possessions of the clan Monro or Munro, situated on the north side of Cromarty Firth, were generally know in the Highlands by the name of Fearrann Donull or Donald's country, being so called, it is said, from the progenitor of the clan, Donald the son of O'Ceann, who lived in the time of Macbeth. The Munroes were vassals of the Earls of Ross, and may be regarded as a portion of the native Scottish Gael. According to Sir George Mackenzie, they came originally from the north of Ireland with the Macdonalds, on which great clan "they had constantly a depending". Their name he states to have been derived from "a mount on the river Roe", county Derry. Clan tradition, probably not more to be relied upon than tradition generally, hold that they formed a branch of the natives of Scotland who, about 357, being driven out by the Romans, and forced to take refuge in Ireland, were located for several centuries on the stream of the Roe, and among the adjacent mountains. In the time of Malcolm II, or beginning of the 11th century, the ancestors of the Munroes are said to have come over to Scotland to aid in expelling the Danes, under the above named Donald, son of O'Ceann, who, for his services, received the lands of East Dingwall in Ross-shire. These lands, erected into a barony, were denominated Foulis, from Loch Foyle in Ireland, and the chief of the clan was designated of Foulis, his residence in the parish of Kiltearn, near the mountain called Ben Uaish or Ben Wyvis. So says tradition. Another conjecture as to the origin of the name Munro is that, from having acted as bailiffs or stewards to the Lord of the Isles in the earldom of Ross, they were called "Monrosses". Skene, as we have said, ranks the clan as members of a great family called the Siol O'Cain, and makes them out to be a branch of the clan Chattan, by ingeniously converting O'Cain into O'Cathan, and thus forming Chattan. Sir George Mackenzie says the name originally was Bunroe. Hugh Munro, the first of the family authentically designated of Foulis, died in 1126. He seems to have been the grandson of Donald, the son of O'Ceann above mentioned. Robert, reckoned the second baron of Foulis, was actively engaged in the wars of David I and Malcolm IV. Donald, heir to Robert, built the old tower of Foulis. His successor, Robert, married a daughter of the Earl of Sutherland. George, fifth baron of Foulis, obtained charters from Alexander II. Soon after the accession of Alexander III, an insurrection broke out against the Earl of Ross, the feudal superior of the Munroes, by the clans Ivor, Talvigh, and Laiwe, and other people of the province. The earl having apprehended their leader, and imprisoned him at Dingwall, the insurgents seized upon his second son at Balnagowan, and detained him as a hostage till their leader should be released. The Munroes and the Dingwalls immediately took up arms, and setting off in pursuit, overtook the insurgents at Bealligh-ne-Broig, between Ferrandonald and Loch Broom, where a sanguinary conflict took place. "The clan Iver, clan Talvigh, and clan Laiwe", says Sir Robert Gordon, "wer almost uterlie extinguished and slain". The earl's son was rescued, and to requite the service performed he made various grants of land to the Munroes and Dingwalls. Sir Robert Munro, the sixth of his house, fought in the army of Bruce at the battle of Bannockburn. His only son, George, fell there, leaving an heir, who succeeded his grandfather. This George Munro of Foulis was slain at Halidonhill in 1333. The same year, according to Sir Robert Gordon, although Shaw makes the date 1454, occurred the remarkable event which led to a feud between the Munroes and Mackintoshes. Robert, the eighth baron of Foulis, married a niece of Eupheme, daughter of the Earl of Ross, and queen of Robert II. He was killed in an obscure skirmish in 1369, and was succeeded by his son, Hugh, ninth baron of Foulis, who joined Donald, second Lord of the Isles, when he claimed the earldom of Ross in right of his wife. The forfeiture of the earldom of Ross in 1476, made the Munroes and other vassal families independent of any superior but the crown. In the charters which the family of Foulis obtained from the Scottish kings, at various times, they were declared to hold their lands on the singular tenure of furnishing a ball of snow at Midsummer if required, which the hollows in their mountain property could at all times supply; and it is said that when the Duke of Cumberland proceeded north against the Pretender in1746, the Munroes actually sent him some snow to cool his wines. In one charter, the addendum was a pair of white gloves or three pennies. Robert, the 14th baron, fell at the battle of Pinkie in 1547. Robert More Munro, the 15th chief, was a faithful friend of Mary, queen of Scots. Buchanan states, that when that unfortunate princess went to Inverness in 1562, "as soon as they heard of their soveriegn's danger, a great number of the most eminent Scots poured in around her, especially the Frasers and Munroes, who were esteemed the most valiant of the clans inhabiting those countries". These two clans took for the Queen Inverness castle, which had refused her admission. With the Mackenzies the Munroes were often at feud, and Andrew Munro of Milntown defended, for three years, the castle of the canonry of Ross, which he had received from the Regent Moray in 1569, against the clan Kenzie, at the expense of many lives on both sides. It was, however, afterwards delivered up to the Mackenzies under the act of pacification. The chief, Robert More Munro, became a Protestant at an early period of the Scottish Reformation. He died in 1588. His son, Robert, sixteenth baron of Foulis, died without issue in July 1589, and was succeeded by his brother, Hector Munro, seventeenth baron of Foulis. The latter died 14th November 1603. Hector's eldest son, Robert Munro, eighteenth chief of Foulis, styled "the Black Baron", was the first of his house who engaged in the religious wars of Gustavus Adolphus, in the 17th century. In 1626, he went over with the Scottish corps of Sir Donald Mackay, first Lord Reay, accompanied by six other officers of his name and near kindred. Doddridge says of him, that "the worthy Scottish gentleman was so struck with a regard to the common cause, in which he himself had no concern but what piety and virtue gave him, that he joined Gustavus with a great number of his friends who bore his own name. Many of them gained great reputation in this war, and that of Robert, their leader, was so eminent that he was made colonet of two regiments at the same time, the one of horse, the other of foot in that service". In 1629 the laird of Foulis raised a reinforcement of 700 men on his own lands, and at a later period joined Gustavus with them. The officers of Mackays and Munro's Highland regiments who server under Gustavus Adolphus, in addition to rich buttons, wore a gold chain round their necks, to secure the owner, in case of being wounded or taken prisoner, good treatment, or payment for future ransom. In the services of Gustavus there were at one time not less than "three generals, eight colonels, five lieutenant-colonels, eleven majors, and above thirty captains, all of the name of Munro, besides a great number of subalterns". The "Black Baron" died at Ulm, from a wound in his foot, in the year 1633, and leaving no male issue, he was succeeded by his brother, Hector Munro, nineteenth baron of Foulis, who had also distinguished himself in the German wars, and who, on his return to Britain, was created by Charles I a baronet of Nova Scotia, 7th June 1634. He married Mary, daughter of Hugh Mackay of Farr, and dying in 1635, in Germany, was succeeded by his only son, Sir Hector, second baronet, who died, unmarried, in 1651, at the age of 17. The title and property devolved on his cousin, Robert Munro of Opisdale, grandson of George, third son of the fifteenth baron of Foulis. During the civil wars at home, when Charles I called to his aid some of the veteran officers who had served in Germany, this Colonel Robert Munro was one of them. He was employed chiefly in Ireland from 1641 to 1645, when he was surprised and taken prisoner personally by General Monk. He was subsequently lieutenant-general of the royalist troops in Scotland, when he fought a duel with the Earl of Glencairn. Afterwards he joined Charles II in Holland. After the Revolution he was appointed commander-in-chief of the forces in Scotland. Sir Robert Munro, third baronet of Foulis, died in 1688, and was succeeded by his eldest son, Sir John, fourth baronet, who, in the Scottish convention of estates, proved himself to be a firm supporter of the Revolution. He was such a strenuous advocate of Presbyterianism, that, being a man of large frame, he was usually called "the Presbyterian mortarpiece". In the Stuart persecutions, previous to his succession to the title, he had for his adherence to the covenant, been both fined and imprisoned by the tyrannical government that then ruled Scotland. He died in 1696. His son, Sir Robert, fifth baronet, though blind, was appointed by George I high sheriff of Ross, by commission, under the great seal, dated 9th June 1725. He married Jean, daughter of John Forbes of Culloden, and died in 1729. His eldest son, Sir Robert, twenty-seventh baron and sixth baronet of Foulis, a gallant military officer, was the companion in arms of Colonel Gardiner, and fell at the battle of Falkirk, 17th January 1746. In May 1740, when the Independent companies were formed into the 43d Highland regiment (now the 42d Royal Highlanders), Sir Robert Munro was appointed lieutenant-colonel, John Earl of Crawford and Lindsay being its colonel. Among the captains were his next brother, George Munro of Culcairn, and John Munro, promoted to be lieutenant-colonel in 1745. The surgeon of the regiment was his younger brother, Dr James Munro. The fate of Sir Robert's other brother, Captain George Munro of Culcairn, was peculiar. He was shot ont he shores of Loch Arkaig among the wild rocks of Lochaber, on Sunday, 31st August 1746, by one of the rebels named Dugald Roy Cameron, or, as he is styled in tradition, Du Rhu. After the Rebellion, an order was issed to the Highlanders to deliver up their arms. Dugald, accordingly, sent his son to Fort-William with his arms to be delivered up. When proceeding down Loch Arkaig, the young man was met by an officer of the name of Grant, who was conducting a party of soldiers into Knoydart, and being immediately seized, was shot on the spot. His father swore to be revenged, and learning that the officer rode a white horse, he watched behind a rock for his return, on a height above Loch Arkaig. Captain Munro had unfortunately borrowed the white horse on which Grant rode, and he met the fate intended for Grant. Dugald Roy escaped, and afterwards became a soldier in the British service. Sir Robert left a son, Sir Harry Munro, seventh baronet and twenty-fifth baron of Foulis, an eminent scholar and a M.P. His son, Sir Hugh, eighth baronet, had an only daughter, Mary Seymour Munro, who died January 12, 1849. On his decease, May 2, 1848, his kinsman, Sir Charles, became ninth baronet and twenty-seventh baron of Foulis. He was eldest son of George Munro, Esq of Culrain, Ross-shire (who died in 1845), and lineal male descendant of Lieutenant-general Sir George Munro, next brother to the third baronet of this family. He married - 1st, in 1817, Amelia, daughter of Frederick Browne, Esq, 14th dragoons; issue, five sons and two daughters; 2d, in 1853, Harriette, daughter of Robert Midgely, Esq of Essington, Yorkshire. Charles, the eldest son, was born in 1824, married in 1847, with issue. The military strength of the Munroes in 1715 was 400, and in 1745, 500 men. The clan slogan or battle cry was "Caisteal Foulis na theine" - Castle Foulis in flames. Badge: Garbhag an Ghlinn, otherwise Crotal a mada�ruadh (Lycopodium clavatuin) common club moss. Slogan: Caisteal Foulis na theine. Pibroch: Failte Rothich and Beallach na Broige. MUCH Controversy has been excited regarding the origin of the name Munro. Clan tradition, detailed by Sir George MacKenzie, has it that the race, with others of the original Celtic inhabitants, was driven out of Caledonia by the Romans in the middle of the fourth century. Settling in County Derry in Ireland, they took the name from a mount on the River Roe there, and on returning to Scotland in the reign of Malcolm II. to help in expelling the Danes, they retained the name. According to the same tradition the lands on which they settled, formerly known as East Dingwall, received the name of Foulis from association with the River Foyle in Ireland. The whole story seems, to say the least, far-fetched. Sir George MacKenzie says the name was originally Bunroe, but there is nothing to confirm the statement. It seems much more likely that the cognomen had the same origin as the name of Montrose on the east coast of Scotland, which was originally known as Munros�" the hill promontory or "the moss promontory." This would agree with the location of the territory of the chiefs on the south of Ben Wyvis in Ross-shire, the "promontory country," on the northern shore of the Cromarty Firth. The first known of the race is said to have been a certain Donald O�Ceann, of the time of Macbeth. The patronymic O�Ceann, Skene, in his Highlanders of Scotland, ingeniously converts into O�Cathan, and so makes out that the race is a branch of the great Clan Chattan or Siol O�Cain. It seems much more likely, however, that the name Donald O�Ceann is simply what it says�Donald, son of the Chief. The same word is found in the name of the contemporary Malcolm III., who was known as Ceannmore or Canmore, "great Chief," by his Gaelic subjects. The Munroes are also known among the Highlanders as Clan Rothich or Roich. From this Donald O�Ceann, its first possessor, the territory on the north side of Cromarty Firth came to be known as Fearran Donuill, or Donald�s Country. Foulis, or Fowlis, the actual seat of the Chief from then till now, is a local and personal name common in Scotland. There are parishes of Fowlis.Easter and F�owlis-Wester in Perthshire, and a family of Fowlises or Foulises were the owners from whom the ancestor of Lord Linlithgow in the reign of Charles I. acquired by marriage the valuable mining property of Leadhills in Lanarkshire. Hugh Munro of Foulis, who died in 1126, is believed to have been a son of George, son of Donald O�Ceann. His son Robert, who is reckoned to have been the second laird or baron of Foulis, took part in the wars of David I. and Malcolm IV., and died in 1164. It was Robert�s heir, Donald (died 1192) who built the old tower of Foulis, and Donald�s successor, another Robert, married a daughter of the Earl of Sutherland. It was to George, son of this pair, that, according to Nisbet�s Heraldry, William, Earl of Sutherland, in the reign of Alexander II. granted a charter which runs, "carissimo et fidelissimo cons sanguineo, Georgio Munro de Foulis." On the introduction of the feudal system, however, the Munroes had secured their possessions by accepting charters, not from the Earls of Sutherland but from their more immediate neighbours, the Earls of Ross. One of these charters, about 1350, expressly states that the lands of Easter Fowlis had belonged to the Munroes in free possession from the time of Donald O�Ceann. The reddendo mentioned for the lands of Pitlundie was a pair of white gloves or three pennies if required. Meanwhile the friendship with the Earl of Ross had involved the Munroes in serious trouble. In 1282 the clans Iver, Talvigh, and Laiwe, with others, had rebelled against the Earl, the latter seized their leader and imprisoned him at Dingwall, and the rebels, to safeguard their chief, carried off the Earl�s second son from Balnagown, and held him as a hostage. Thereupon, according to Sir Robert Gordon, " the Munroes and the Dingwalls, with some others, gathered their forces and pursued the Highlanders with all diligence, so overtaking them at Beallach na Croig, betwixt Ferrindonnel and Loch Broom. There ensued a cruell fight, well foughten on either side. The clan Iver, clan Talvighe, and clan Laiwe were almost utterlie extinguished and slain, but the Munros had a sorrowful victory, with great loss of their men, yet carrjed back again the Earl of Ross his son. The Laird of Kildun was ther slain, with seven score of the surname of Dingwall. Divers of the Munroes were slain in this conflict, and there were killed eleven of the house of Foulis, that were to succeed one another, so that the succession fell unto a child then lying in his cradel." Thus ended "carrissimus et fidelissimus Georgius Munro de Foulis." Robert, the infant in the cradle, fought in Bruce�s army at Bannockburn. His only son, George, was slain in the battle, but left an heir, another George, who fell at Halidon Hill in 1333. In 1341, while Robert, the son of this chief, was still an infant, occurred an event which would seem to show that the Munroes were certainly not regarded as kinsmen by the Captains of the Clan Chattan. John Munro, the "tutor " or guardian of Foulis, was treated with some indignity by the inhabitants of Strathardle as he passed through that country. For this his clansmen eagerly desired revenge, and the tutor accordingly raised a force of 350 picked men, with which he raided the Strathardle lands. As he returned past the Mackintosh seat of Moy, Mackintosh demanded his toll of the plunder. The tutor offered a share, but Mackintosh demanded nothing less than half. "Wherewith John Munro would not hearken nor yield, but goeth on his intended journie homeward, MacIntosh conveens his forces with all diligence, and follows John Munroe, whom he overtook at Clagh ne Hayre, besyd Inverness, hard by tife ferry of Kessack. John, perceaving MacIntosh and his company following, then bard at hand, sent fiftie of his men home to Ferrindonald with the spoil, and encouraged the rest to fight. So there ensued a cruell conflict, wherein MacIntosh was slain, with the most part of his companie. Divers of the Munroes were also ther killed. John Munroe was left as deid in the field, and was taken up by the Lord Lovet, who carried him to his house, where he was cured of his wounds, and wes from thenceforth called John Bacclawigh becaus he wes mutilat of one of his hands all the rest of his days." Robert Munro of Foulis, the eighth laird, who was in tutelage at the time of this conflict, and was slain in an obscure skirmish in 1369, married a niece of Euphemia, daughter of the Earl of Ross and second wife of King Robert II. By this marriage the Munro chiefs became nearly related, not only to the royal house of Stewart but to Robert II.�s grandson, Donald, Lord of the Isles, who married the sister of the last northern Earl of Ross, and claimed the earldom in her right. When, therefore, the Island Lord set out to make good his claim at the battle of Harlaw in 1411 he was joined by Hugh Munro, the next laird of Foulis, his wife�s cousin. 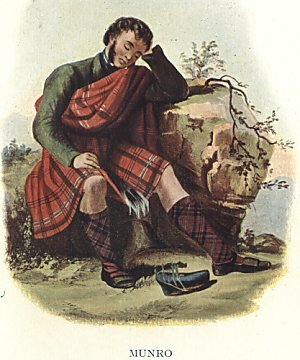 Hugh Munro�s successor, George, was killed in one of the conflicts of these wars of the Isles and the Douglases in 1454, but when towards the end of the century the troubles ended with the forfeiture of the earldom of Ross and the ruin of the last Lord of the Isles, the Munroes escaped scatheless, and indeed rose in rank by having their vassalage transferred to the Crown. The fresh charters which they then obtained from the King declared that they held their lands on condition of furnishing a snowball at midsummer if required. This condition they could easily fulfil, as snow was to be found in some of the mountain corries of their property all the year round. William, second in succession to the chief slain in 1454, died, like so many of his ancestors, by violence in 1505. His successor, Hector Munro of Foulis, married Katherine, daughter of Sir Kenneth MacKenzie of Kintail, and their son Robert, the next chief, fell fighting against the English aggression at the battle of Pinkie in 1547. His son, Robert More Munro, the fifteenth chief, took the part of Queen Mary against the Earl of Huntly. To judge from the narrative of George Buchanan, the clan was now regarded as one of the chief in the north. When Huntly�s henchman refused the Queen admission to her castle of Inverness in 1562, the famous Latin historian wrote, " When they heard of the Queen�s danger a great host of the Scottish notables, some under pressure, some of their own accord, attached themselves to her, foremost among them being the Frasers and Munros, among the most valiant of these tribes." In view, probably, of the help afforded to the Queen�s cause and his own on that occasion, the Regent Moray in 1569 entrusted the castle of the canonry of Ross to Andrew Munro of Milntown, and this doughty castelan defended the stronghold for three years, at the cost of many lives, against the attacks of the MacKenzies, with whom the Munroes were then at feud. it was only under the later act of pacification that the castle was finally delivered up to the MacKenzies. Robert More Munro, the chief of that time, already mentioned, became a Protestant in the early days of the Reformation, and this fact practically decided the future politics of the clan. It was probably in consequence of this that Robert Munro. the eighteenth chief, remembered in Highland tradition as "the Black Baron," proceeded in 1626 to join the Protestant forces of Gustavus Adolphus. He and six other officers of his name went over with the Scottish corps raised by Sir Donald MacKay, first Lord Reay, head of the other chief Protestant clan of the north, and three years later he raised a regiment of 700 men on his own lands. According to Doddridge, "The worthy Scottish gentleman was so struck with a regard to the common cause, in which he himself had no concern but what piety and virtue gave him, that he joined Gustavus with a great number of his friends who bore his own name. Many of them gained great reputation in this war, and that of Robert, their leader, was so eminent that he was made colonel of two regiments at the same time, the one of horse, the other of foot." In the service of Gustavus there were at one time no fewer than " three generals, eight colonels, five lieutenant-colonels, eleven majors, and above thirty captains all of the name of Munro, besides a great number of subalterns." The Black Baron died from a wound in the foot at Ulm in 1633. His brother Hector, who succeeded as nineteenth Laird of Foulis, also distinguished himself in the wars of Gustavus, and was created a Baronet of Nova Scotia by Charles I. in 1634. His son, another Sir Hector, dying in Holland in his seventeenth year in 1651, was succeeded by his distant kinsman, Robert Munro of Obsdale. Sir Robert was also a veteran of the wars of Gustavus Adolphus. In our own Civil Wars he served Charles I. chiefly in Ireland, from 1641 to 1645, when he was surprised and taken prisoner personally by General Monk. In the Royalist army he had one son a Major-General, two of the rank of Colonel, and one a Captain. He was afterwards Lieutenant-General of the Royalist troops in Scotland, where he fought a duel with the Earl of Glencairn. He afterwards joined the young Charles II in his exile in Holland, and at the Restoration was made commander-in-chief of the forces in Scotland. He is generally understood to have been the original of Dugald Dalgetty in Scott�s Legend of Montrose. He died before the Revolution in 1668. His eldest son, Sir John Munro, the fourth baronet, was such a strenuous supporter of Presbyterianism, that, being of massive frame, he was known as "the Presbyterian mortar-piece." He had been fined and imprisoned as a Covenanter, and at the Revolution he naturally took the side of William of Orange. His son, Sir Robert, though blind, was made High Sheriff of Ross by George I. in 1725. During the risings of 1715 and 1719 his clan did much to check the activities of the MacKenzies and other Jacobite clans. This chief further influenced the future policy of the clan by marrying Jean, daughter of John Forbes of Culloden. With these antecedents his eldest son, another Sir Robert, naturally took the Government side against the Jacobite risings of his time. He was Member of Parliament for Ross-shire. When the Independent Companies were, in May, 1740, formed into the 43rd Highland Regiment, afterwards famous as the 42nd or Black Watch, he was appointed lieutenant-colonel, the Earl of Crawford and Lindsay being Colonel. Sir Robert�s next brother, George Munro of Culcairn, was one of the captains, while another was John Munro, who became Lieutenant-Colonel in 1745. The chief�s youngest brother, Dr. James Munro, was surgeon of the regiment. In the Jacobite rising of 1745 the Munroes, following their chief, took the side of the Government, and played an important part in keeping the remoter northern counties for King George. The campaign, however, proved costly to the house of the chief. At the battle of Falkirk in January, 1746, Sir Robert himself fell, with his brother Dr. Munro. So greatly were they respected that the Jacobite victors, after the battle, buried them with military honours in Falkirk churchyard. The fate of Sir Robert�s other brother, George Munro of Culcairn, was not less tragic. After Culloden, at which the clan took part in full force, the Highland clans were ordered to deliver up their arms. In fulfilment of this order one of the Jacobite clansmen, Dugald Roy Cameron, sent his son to Fort William to surrender some weapons. As the young man passed down Loch Arkaig, he was met by a party of soldiers under an officer named Grant, by whom he was seized and forthwith shot. Vowing vengeance upon the slayer of his son, who, he learned, rode a white horse, Dugald Roy lay in wait behind a rock above Loch Arkaig for the officer�s return. By and by, as the troop came back, he took careful aim at the officer riding the white horse and shot him dead. Unfortunately, however, Captain Munro had borrowed the horse, and it was he who was shot instead of Grant. On learning his mistake Dugald Roy gave up his vengeance, and became a soldier in the Government service. Sir Robert�s son, Sir Harry Munro, seventh baronet and twenty-fifth Chief, was an eminent scholar and Member of Parliament. His son, Sir Hugh, left no heir to the baronetcy, and was succeeded by his kinsman Charles Munro of Culraine, lineal male descendant of Lieutenant-General Sir George Munro, next brother of the third baronet. Sir Charles served with high credit under Wellington in Portugal, Spain, and France, and was wounded at the storming of Badajos. He also distinguished himself under Bolivar in the South American War of Independence, and commanded a division at the battle of Agnotmar, where the Spanish army surrendered to the Colombian general. The present Chief, Sir Hector Munro of Foulis, eleventh baronet and twenty-ninth laird, is his grandson. Among his other honours he is A.D.C. to the King and Lord-Lieutenant of Ross and Cromarty. Among its cadets the house includes the family represented by Sir Hugh Munro, Bart., of Lindertis, in Forfarshire. This family is descended through younger sons from the Foulis chief who fought at Harlaw. Its immediate ancestor was General Sir Thomas Munro, Governor of Madras from 1820 to 1827, whose father, a wealthy Glasgow Virginia merchant, was ruined by the American War of Independence in 1776. The General�s sister became the wife of the Hon. Henry Erskine, the famous Scottish lawyer and wit. Another distinguished cadet was Sir Hector Munro of Novar, also an eminent Indian commander. He is said to have spent �120,000 in improving his estate on the Cromarty Firth. He died unmarried, but left three natural children. Of these the elder son Hugh, an officer in India, was killed by a tiger, and the younger, Alexander, was devoured by a shark, both in their father�s lifetime. The daughter, Jane, married Colonel Sir Ronald Crauford Ferguson of Raith near Kirkcaldy, and her grandson is the present Right Hon. Sir Ronald Crauford Munro-Ferguson, P.C., G.C.M.G., of Raith and Novar, late Governor-General of Australia, created Lord Novar in 1921, and now Secretary for Scotland. The clan has also a distinguished representative in literature in the person of Dr. Neil Munro the Celtic novelist, of the Loch Fyneside sept of the name; in archeology by the late Dr. Robert Munro, the eminent authority on lake-dwellings; and in politics by the Right Hon. Robert Munro, K.C., P.C., late Secretary for Scotland, now Lord Justice Clerk of the Court of Session, under the title of Lord Alness. Septs of CLAN MUNRO: Dingwall, Foulis, MacCulloch, MacLulich, Vass, Wass. The Munroes claim to be early natives of Scotland who were driven out by the Romans around 357 A.D. and took refuge in Ireland. At the beginning of the 11th century, the clan supposedly returned to help expel the Danes, or Norsemen, from Scotland. They were under the leadership of Donald, son of O'Caenn who, for his services received the lands of East Dingwell in Ross-shire. These lands la ter became the Barony of Foulis, and thereafter the chief and his family were designated "of Foul is". The clan spread into Sutherland and were also given a charter for lands in Strathspey in 1309. The chiefs were Bailies to the Macdonalds, Earls of Ross and Lords of the Isles. Robert of Foulis supported Robert the Bruce at Bannockburn in 1314. Robert Mor, 15th chief was a staunch supporter of Mary Queen of Scots and he received many favours from her son James VI. During the 17th century, the Munroes fought in the continental wars and Robert 18th chief joined the army of Gustavus Adolphus, raising 700 of his own clan for service in Sweden and Denmark in defence of protestantism. He greatly distinguished himself and his Scots received the name of the "Invincibles". The Munroes supported the government during the Jacobite uprisings and it was Munro of Foulis who was one of the original commanders of the six independent companies when they were raised in 1725. In 1740 when the companies of the "Black Watch" were formed into the 43rd (and later 42nd) Regiment, Sir Robert Munro, 6th Bart was appointed Lieutenant Colonel. This tradition of distinction in military service was to continue throughout the 19th and 20th centuries. Captain Patrick Munro of Foulis had the family seat of Foulis castle in Ross-shire and after his death c1990's Hector Munro succeeded him as Chief of the Clan.